Granted it wasn’t a job interview, but once during an interview with a prominent community bank CEO, I kept my smartphone out on the conference room table where we were meeting. I explained to him my wife was expecting our second child any day and I needed to keep my phone handy. Maybe under the same circumstances during a job interview at a restaurant, the use of a smartphone could be acceptable, but otherwise, the odds aren’t in your favor. According to one research study, having the smartphone out – and using it – may be the equivalent of having a glass of wine with your meal. Just because the person interviewing you sends a text (or has a glass of wine) doesn’t mean it’s OK for you to. A recent study co-authored by Peter W. Cardon of the University of Southern California Marshall School of Business and colleagues at Howard University is the first to provide an empirical baseline for how attitudes toward mobile phone use actually break down across gender, age and region. The biggest takeaway from the study for job seekers is to keep the phone tucked away during a meeting. 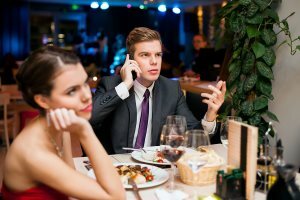 It found a full 20 percent of professionals said simply having your phone out at a business lunch is rude. Three-fourths said checking texts or emails was verboten. Even a higher number, 87 percent, said to turn the phone off and never answer it during a business meeting. The same holds true even at more informal lunch meetings. Two-thirds said it’s wrong to text while knoshing. But men are more flexible on this issue than women. Almost six in ten say it’s copacetic to check text messages during business meals while barely one-third of women felt the same way. Half of all men condone phone calls at a lunch meeting while only 26 percent of women do. Where you’re doing business geographically also makes a different. It turns out the West Coast, which the study authors said has a reputation for being more casual, is more uptight about phone use than their colleagues from the East Coast. The more you make the less tolerant you are of phone use in business meetings, according to the study where the researchers first identified the most common grievances people had about smartphone use among their colleagues, including browsing the Internet and checking text messages. They then asked working professionals earning at least $30,000 a year to identify which of these behaviors they considered acceptable – and which ones are flat-out rude. It’s probably not surprising that younger professionals are more willing to accept texting during a business lunch. The study determined 66 percent of people under 30 said texting or emailing was okay, compared to just 20 percent of those aged 51-65. You’re also gambling on getting hired even by answering the phone. The study found that saying “Excuse me” to take a call didn’t cut it. More than 30 percent still found it to be rarely/never appropriate during lunch meetings.